My name is Jerry Micsinszki, I am a certified ISA (International Society of Arboriculture) arborist, a certified Ontario Utility Arborist, a certified Greens Keeper and founder of Pineridge Tree Service Ltd. I have been in the tree industry since 1976. To continue this legacy we are pleased to announce my daughter, Rachel Bowery, and her husband, Craig Bowery, are taking up the torch. 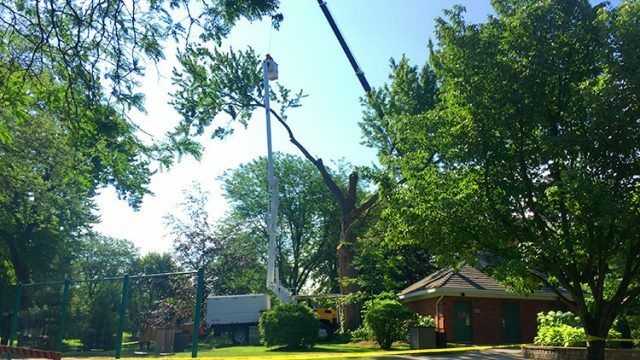 We are truly a family business with the mission to employ & train personnel to safely and properly trim, remove and treat trees in the Niagara Region. Our slogan “Put Our Trained Personnel to Work for You!” is not just a slogan, it’s a goal. Pineridge is committed to providing a safe work environment for all of our employees. Preventing work related illness and injury is very important to us. Pineridge and its employees are committed to co-operating and participating in the Return to work program as well as all policies and procedures as defined. Pineridge Policies and Procedures guidelines and rules’ sole purpose is to ensure and encourage safe work practices so that everyone returns home safely. Our early return to work program is implemented to provide accommodation for an employee who is temporarily or permanently unable to return to their duties as a result of an occupational injury or illness. The program provides opportunities to perform the regular job with modifications or when available, to perform alternate temporary work that meets the injured employee’s functional abilities. We are members of WSIB (Workplace, Safety and Insurance Board), IHSA (Infrastructure Health and Safety), E&USA (Electrical & Utility Safety Association, now a part of IHSA) ISA International, and ISA Ontario Chapter. © Copyright 2019 Pineridge Tree Service. All Rights Reserved. Niagara Website Design by Future Access Inc.
We accept VISA and Mastercard as a payment.